Although the Grand Strand itself incorporates over 60 miles of beaches and residences, Myrtle Beach is the center of all the attractions, the excitement, and the very essence of what our fantastic beaches are all about. Some of the finest homes and resorts can be found on the north end of Myrtle Beach proper, along with one of the original golf course communities, Pine Lakes. In the last several years, a major redevelopment plan has been in the works to make the downtown area more of a luxury resort area and less of a neon-sign-clad "mom and pop" beach. The real estate boom of the mid 90's saw hundreds of fine luxury condo resorts being built, and the older beach homes and motels have largely disappeared. The historic but troublesome Pavilion was torn down, and most recently, the 2.5 mile scenic Myrtle Beach Boardwalk is the start of the total renovation of real estate in the heart of Myrtle Beach. Most of the favorite attractions in the area are located in Myrtle Beach itself. The Carolina Opry, The Dixie Stampede, the awesome shopping complex of Broadway at the Beach, a grand new Convention Center, and other major tourist draws are all in and around the center of the town. Some of the most popular new condos include Bay View Resort, Ocean Reef Resort, Oceans One. Homes in Kingston Plantation. 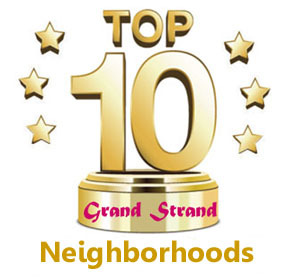 Carolina Forest, Grande Dunes, and Prestwick Golf and Tennis are among the top residential communities. There are so many homes and condos to choose from that you have to find the most knowledgeable Realtors in Myrtle Beach to help you make a wise decision in what is probably the biggest investment you will ever make. We work hard to stay on top of our local market every day to offer you the best advice possible. While housing prices may tend to be just a bit higher in Myrtle Beach than in some of the surrounding smaller beach areas, we are still hundreds of thousands of dollars lower in price than most areas of Florida, and offer just as much. One exception to this might be the very popular Carolina Forest community out on Highway 501 between the Beach and Conway, SC. Carolina Forest is a huge master-planned community with its own school, stores, restaurants, professional offices, and just about everything an entire city usually offers. Taxes are lower, the school is the best in the state, and you can find a beautiful home for under $200,000 - as well as waterfront luxury mansions in the millions. Our winters are mild, yet we have 4 distinct seasons. One can live in the finest gated golf course community, an oceanfront penthouse, an older traditional home a few blocks from the beach, or an inexpensive condo just a few miles inland. We have something for every budget if you prefer to live right in the center of it all...in Myrtle Beach, South Carolina. Below you'll find a sample of the newest MLS listings of real estate in the city of Myrtle Beach. You may also want to read all the information on the most popular condos and communities and browse those listings. When you find something that catches your eye, give us a call and ask us all the questions you have. We are here to help you!